Jump Smart Learning Academy is a full-service child care and preschool family childcare program, located in the Avalon neighborhood of Chicago, Illinois. 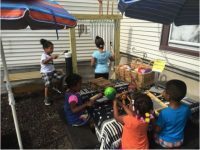 We are a Kohl McCormick award-winning home that offers a unique learning environment and approach to early childhood education and accredited by the National Association for Family Child Care with more than 20 years of experience sparking children’s interest in learning. Our nature site provides hours of exploration and an escape from the stress of living in the city. The uniqueness of our space appeals to the senses as you take a stroll down our winding rock path that connects the sensory, rainbow and fairy gardens. The serenity is captivating as you will often find children sitting quietly admiring the beauty, inhaling the wonderful fragrances of flowers and listening to the sounds of water oozing through the two fountains located in the garden. 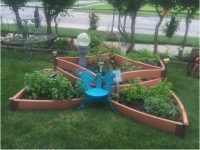 There is a variety of edible plants to enjoy, such as mint leaves and strawberries. 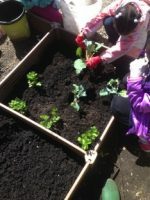 We also have a children’s vegetable garden that was planted to encourage healthy eating. In addition, there is plenty of wildlife that provides teachable moments to reinforce respect for nature and inspire questions from the children. We are overjoyed at the opportunity to become a Certified Nature Explore Classroom site. Watching how this space has become so important in positively shaping our children’s first experiences of the environment is invaluable. 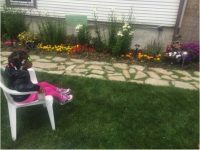 Ownership and pride may be seen as our 3 and 4-year-olds greet their parents during pickup time and excitedly offer a grand tour, showing off their favorite garden space. When the weather permits, our outdoor space transforms into a classroom that offers lots of room for movement. 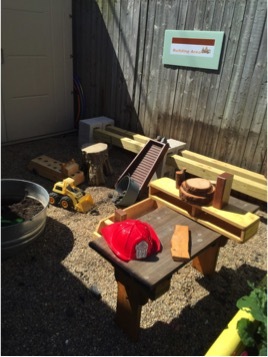 The awesome Building Area provides hours of building using natural materials and a mud kitchen for messy play. There are outdoor instruments, designed by a member in the community, that were inspired by our vision to create this space. Our parents are eager to start their own gardens due to the enthusiasm from their children. 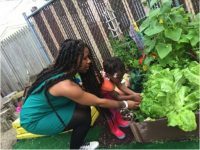 We also encourage families to harvest the vegetables and to prepare meals that we share with the entire class. There are so many members of our community we would like to acknowledge for helping to transform our backyard into a nature oasis for generations of children and families to enjoy. Special acknowledgment to my husband Arthur Burton, for his financial support and his expertise in maintaining the mulberry trees that line the fence. Thanks to Eric Valentine, my father and Mr. Ervin, long time neighbor, for their creativity in installing the dry river creek and Japanese garden. Thanks to our master carpenter Mr. Gregory Gage for creating the Building Area for our site and finally, our wonderful visionary Mr. Carlos Maldenado from PAEC Elementary school who designed and donated the outdoor instruments for our music corner.